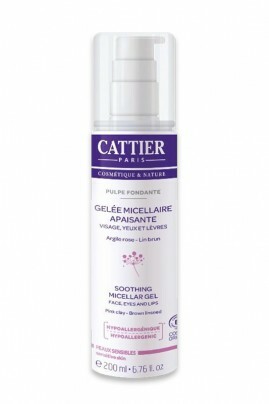 Ideal for sensitive, delicate skin types, CATTIER Pulpe Fondante Micellar Gel gently cleanses and removes make-up from the face and eyes. Its light, refreshing gel creates a soft cushion between the cotton pad and the skin and protects it from overheating. The micelles, soft cleansing agents, capture impurities like a magnet without drying out the skin. The soothing properties of organic brown linseed calm the skin and reduce irritation. Pink clay is rich in minerals and trace elements to soften, soothe and restore the skin's radiance. Organic Damask rose water softens and strengthens the cutaneous barrier. With Cattier Organic Micellar Gel, your skin is clean and healthy ! Super soft cleansing with Cattier "Pulpe Fondante" Micellar ! Apply using a cotton pad or fingertips to the face, eyes and lips. With or without rising. Before going to sleep, apply Organic Sleeping Cream "Tendre Cocon" Cattier. When you wake up, complexion looks bright and luminous ! A respectful composition for sensitive skin !